B. Thomas (Arlington, Texas, United States) on 14 August 2014 in Animal & Insect and Portfolio. 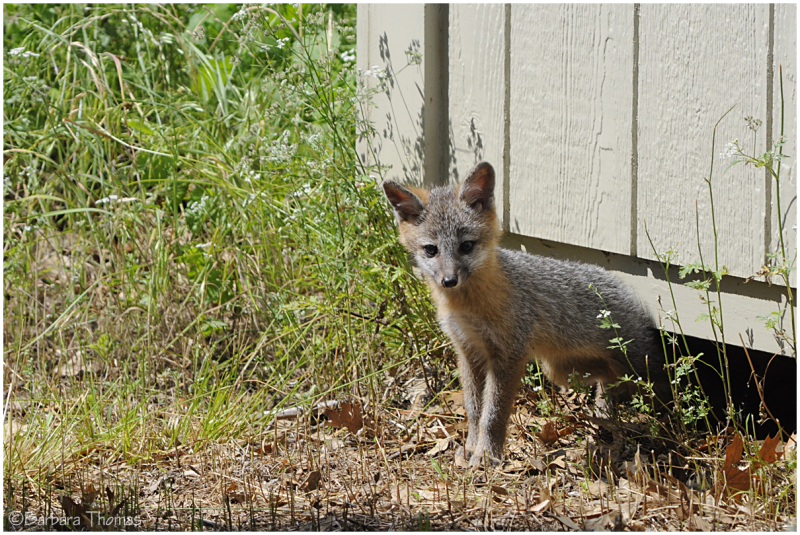 It is common for grey foxes to live in family groups that consist of a male, a female, and their young. The male is known as the dog fox, the female is known as a vixen, and the babies are known as pups, kits, or cubs. Grey foxes are monogamous, so they are very selective when it comes to choosing their life-long mate. This shot is from June when Nacho's 3 pups were living under a shed. The males are good daddy's and help feed the young. What a sweet little moment . . I had them in my yard last night making horrible noises ! Un renardeau bien capté,une superbe rencontre. This pup is SO cute! An extra fine "fox" picture. Really a cute one ! Oh mein Gott - ist der süß ! Ich denke, diese Füchse wohnen wirklich bei dir ! @Sonja: I would be happy to let them inside. ;-) The parents move the babies around to keep them safe, so we only got to see them for 3 days in June before they hid them somewhere else. There is a film by Luc Jacquet - The Fox and the Child. It is beautifully filmed and a good lesson about wild animals. I think you would enjoy it if you could find it. Very nice ! So cute. An adorable capture of this pup!! So cute. I just came here from 8/29 post. You just have such fox medicine as the Natives say. They have a bond with you.